Topics covered include the role and responsibilities of the paediatric first-aider and providing first aid for an infant or a child who is unresponsive and breathing normally. 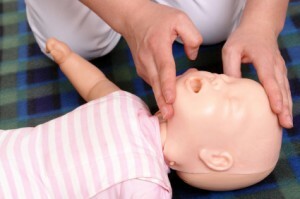 The qualification also covers how to administer first aid to an infant or a child with head and spinal injuries, who is choking or suffering from anaphylaxis. 12 hours split over 2 days or 3 evenings, we run courses on weekday/evenings and at weekends. A Level 3 award in paediatric First Aid (RQF) certificate valid for three years is issued on successful completion of the course. Certification is validated through an approved OfQual awarding body. Price – Please give us a call on 0151 207 0081 for our up to date prices and group discount information.